Another cloudy, overcast day, its been that kind of a summer I’m afraid. Oh well, we’ve brought the waterproofs. 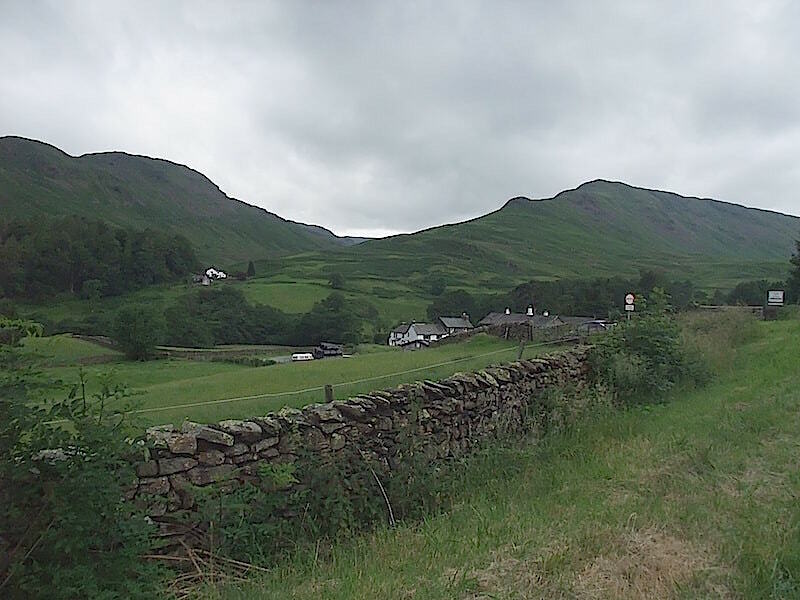 Here I’m standing on the grass verge of the section of the A591 known as Dunmail Raise looking towards the little hamlet of Town Head. The car is parked in a lay-by across the road off to the right of the shot. Walking down the lane towards Town Head, I don’t think there’s much chance of being run over along here. 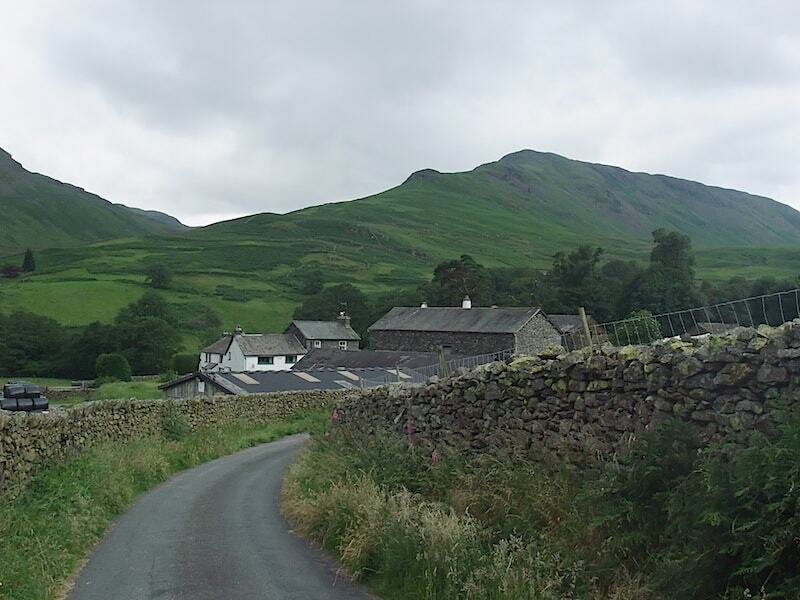 Behind the buildings is our last fell of the day, Steel Fell, although it’ll be a while yet before we get over there. 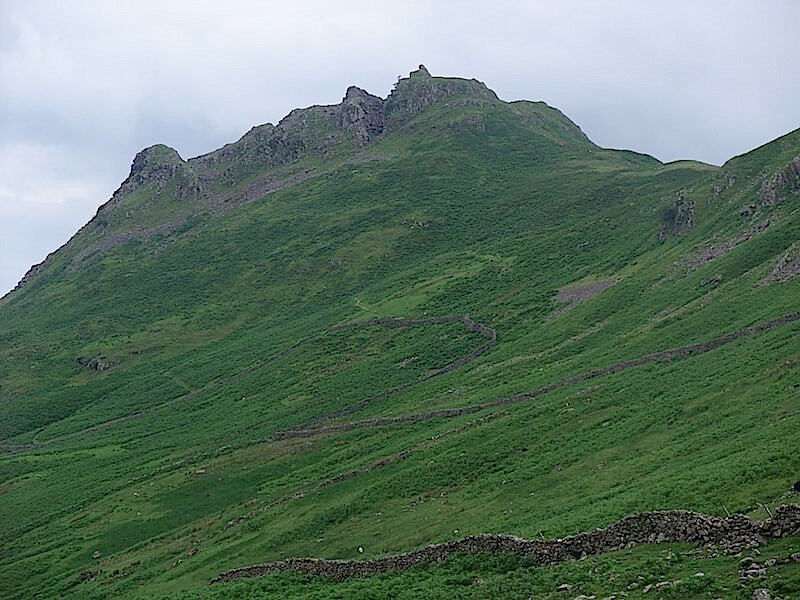 To the left you can just see part of the Helm Crag – Gibson Knott ridge, and that’s where we are going first of all. 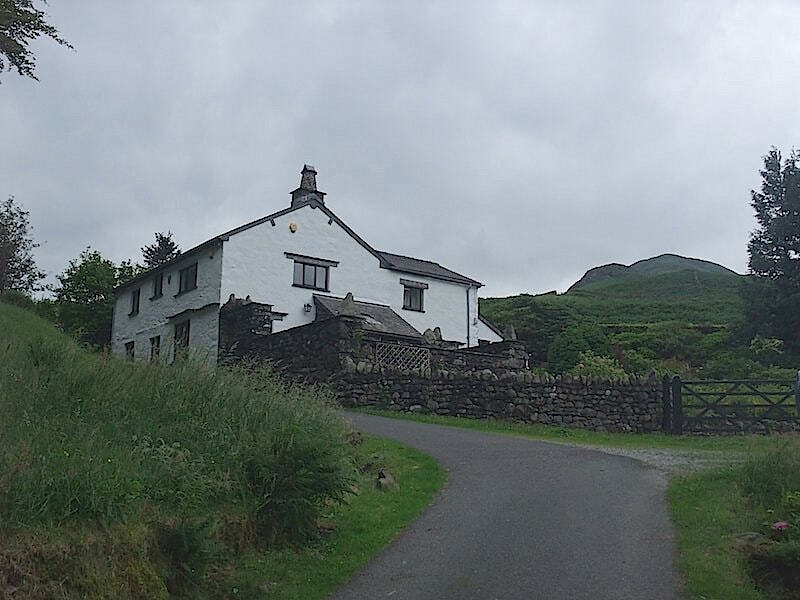 From the Town Head lane we take a right turn and start walking up to Helmside. 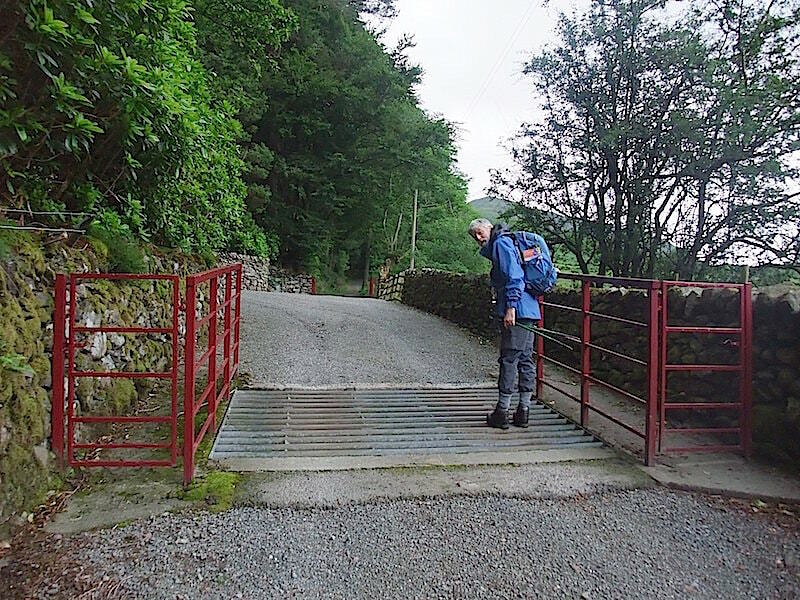 Incidentally, walking across the cattle grid is not compulsory, some of us prefer to open one of the gates on either side and walk through sensibly. Across the cattle grid, round the corner and approaching one of the cottages along Helmside. 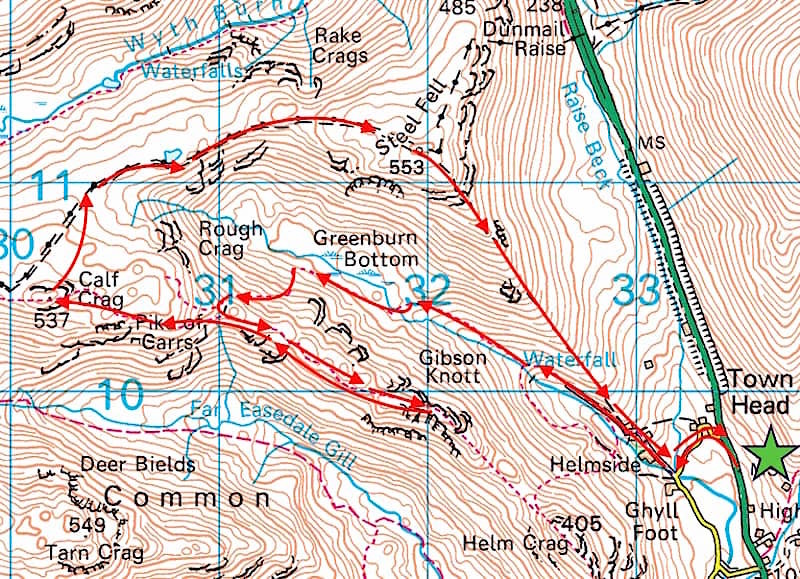 Eventually the tarmac road comes to an end and you arrive at the start of the path along Greenburn Bottom. 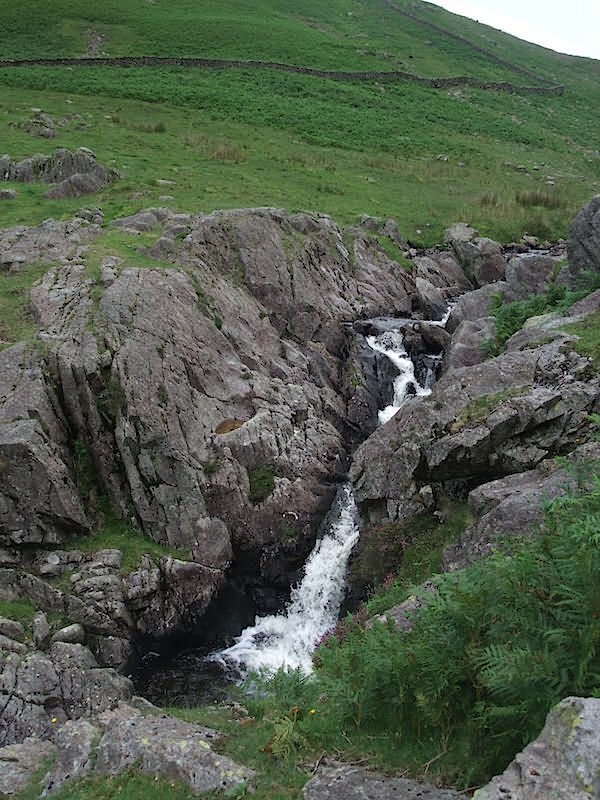 Greenburn Beck runs down the valley creating some attractive waterfalls along its course. 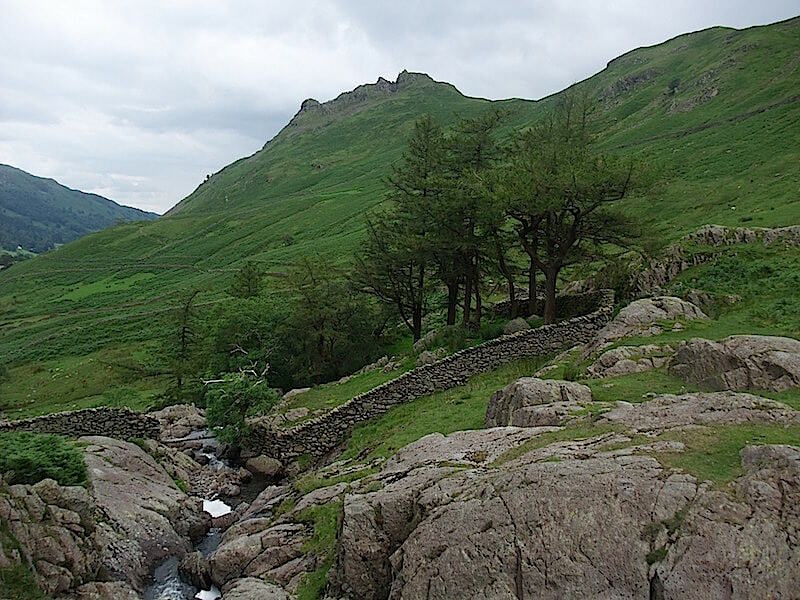 Across the beck, rising steeply on the other side is Helm Crag. 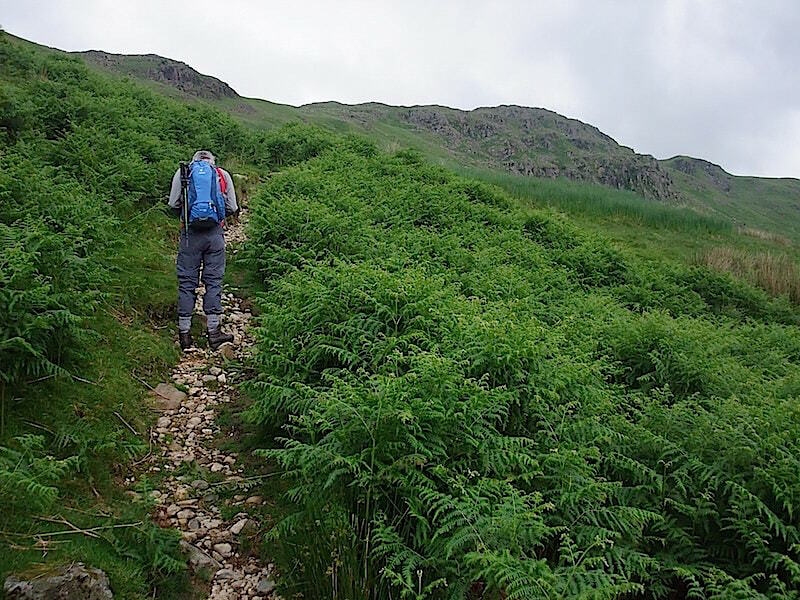 This is a very popular fell with visitors to Grasmere as the walk starts in the village and its not very high, there are only 13 lower fells in AW’s 214 list. Having said that, its what you might call a little ‘tester’. 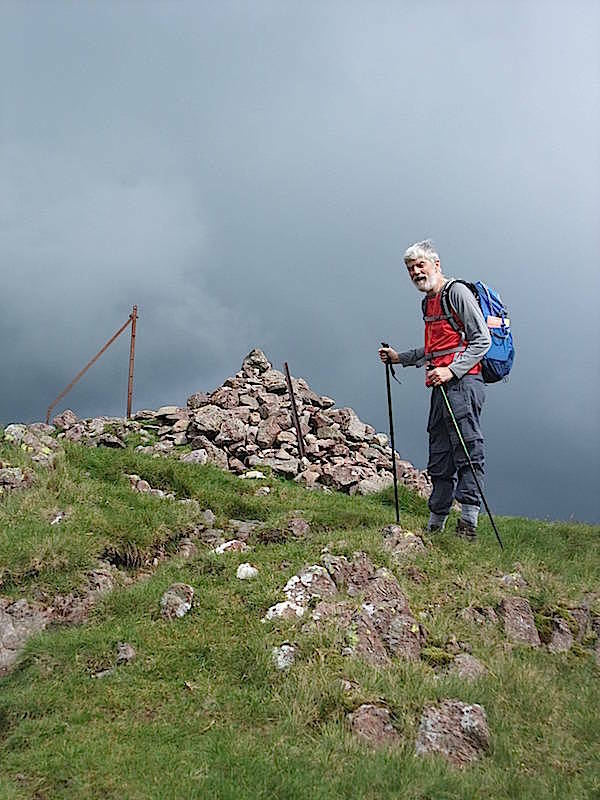 If you are not used to climbing anything at all, as many visitors aren’t, then it will test out those calf and lung muscles as it is fairly steep in places. 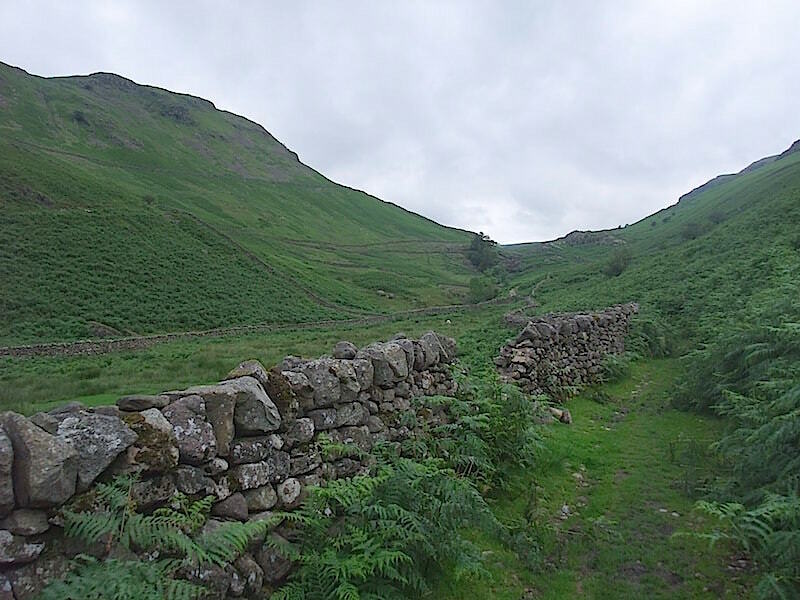 We’ve reached the head of the valley, known as Greenburn Bottom, which looks as though you should be able to walk straight ahead on a lovely, grassy carpet. If you let those looks deceive you you will more than likely end up stuck in the middle of it with water lapping over your boot tops, especially after a prolonged period of rain. The water drains down from the fells but then gets stuck in the flat bottom, unless it can find a way to then drain down into Greenburn beck. 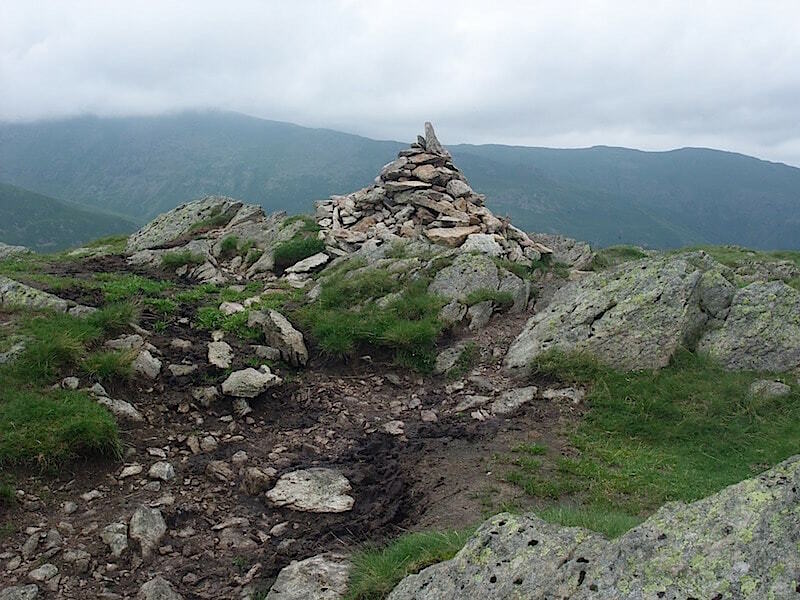 Instead of going straight ahead we take a turn to the left and begin to climb above it up to the ridge. It wasn’t too difficult to find the path today as the bracken hadn’t quite take over. We’re heading for the ridge which you can see on the skyline. 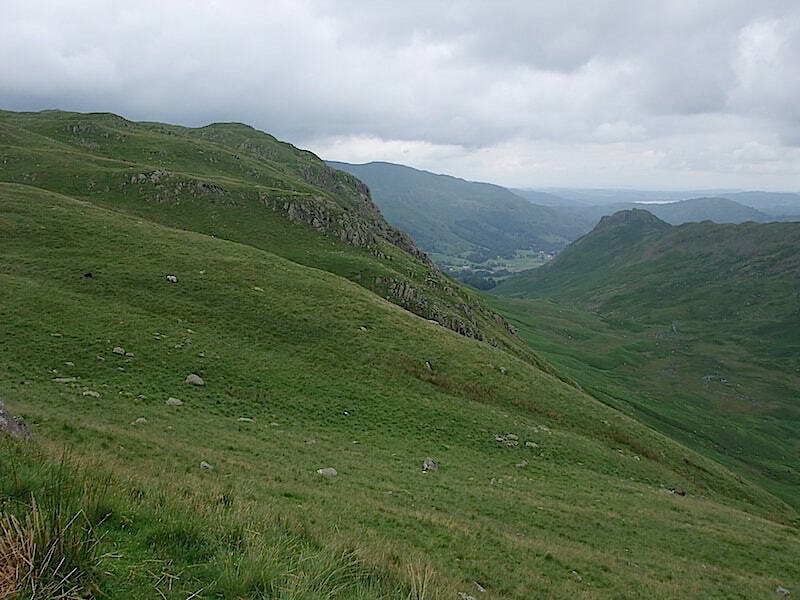 We’ve reached the ridge but before we turn to go over to Gibson Knott we stop for a look up into Far Easedale and a view over to Tarn Crag, that’s the one across the valley with the large rocky area below the top. 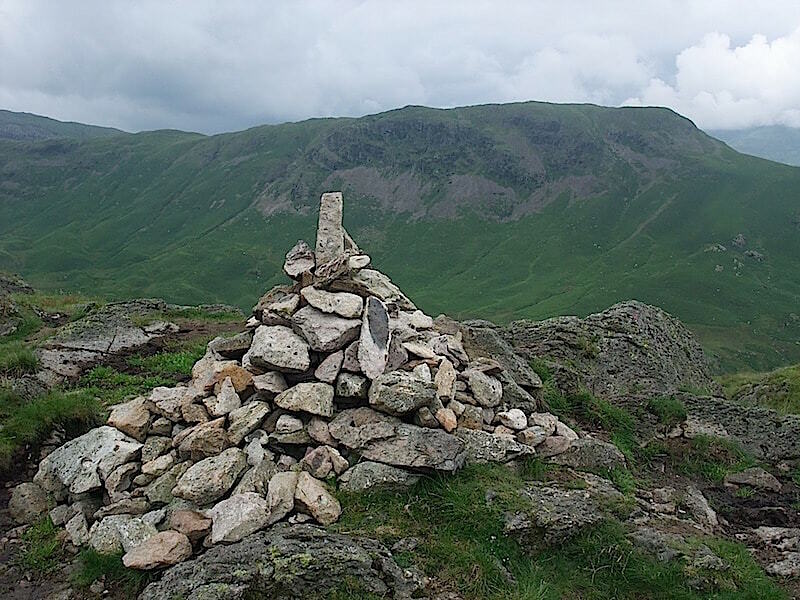 A little further along from where the previous shot was taken and we arrive at Gibson Knott summit cairn. Plenty of churned up muddy patches here and at various points along the path ahead. 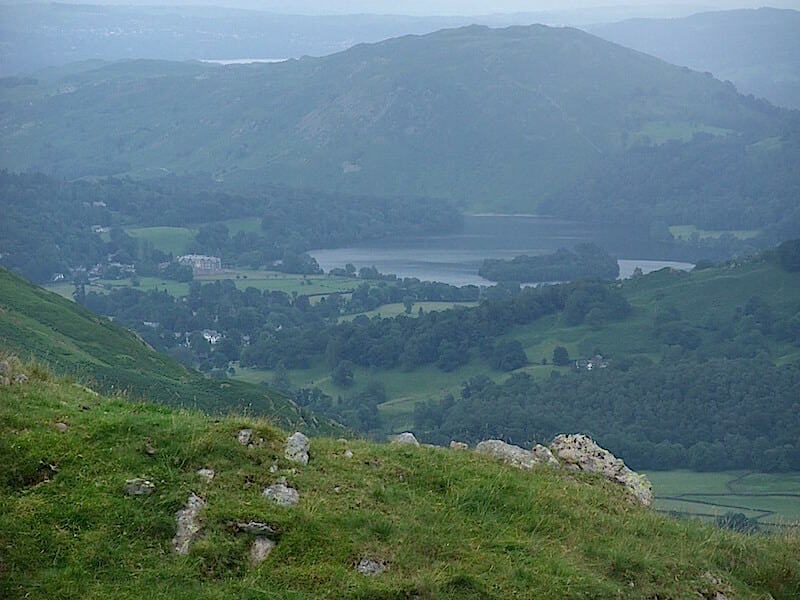 From Gibson Knott the view down to Grasmere, the village and the water share the name, with Loughrigg Fell behind them. 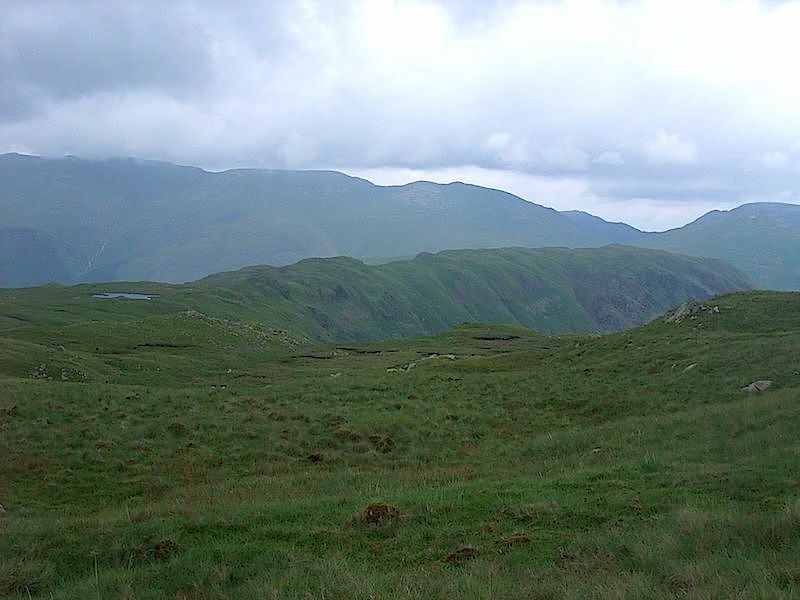 From the summit and looking in the opposite direction the view is of Steel Fell. Do you know that saying about someone ‘looking as though they’ve lost a pound and found a penny’? I’m blaming the photographer for not telling me he was finally ready to take the shot. 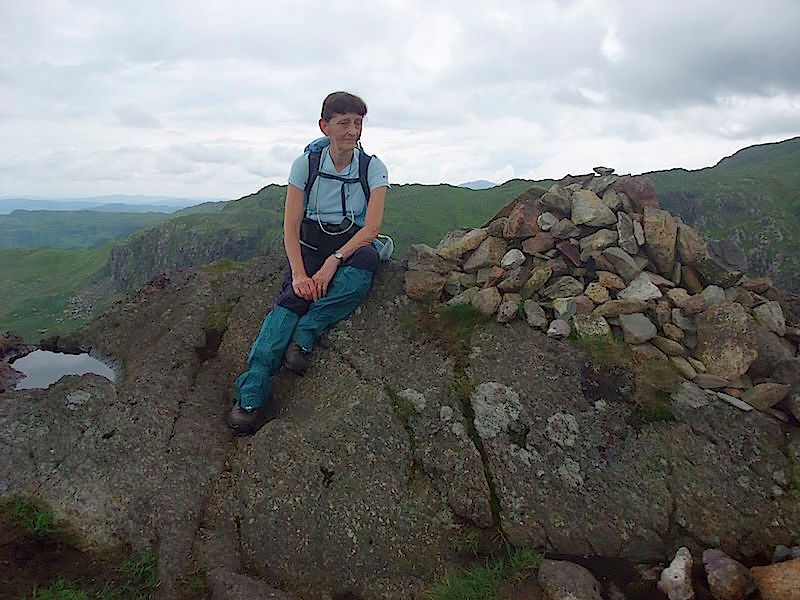 Anyway, here I am, perched on the summit of Calf Crag, waiting patiently for the ‘say cheese’ command. 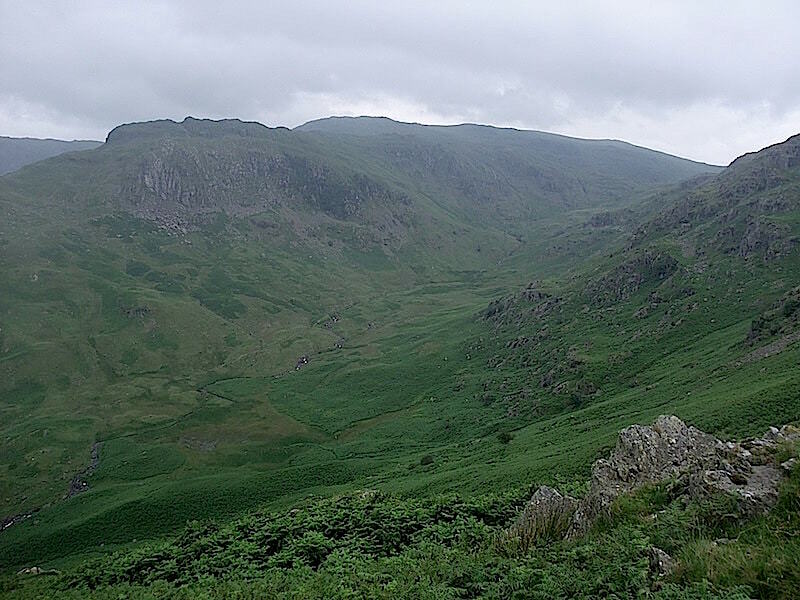 Looking across to Steel Fell from Calf Crag. 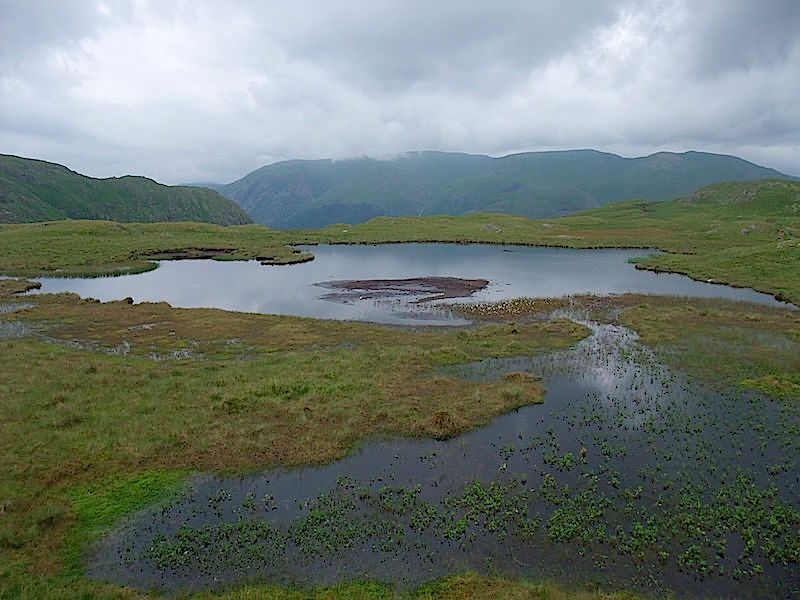 The brown lines across the middle are peat hags, an indication that an area has a tendency towards wetness. 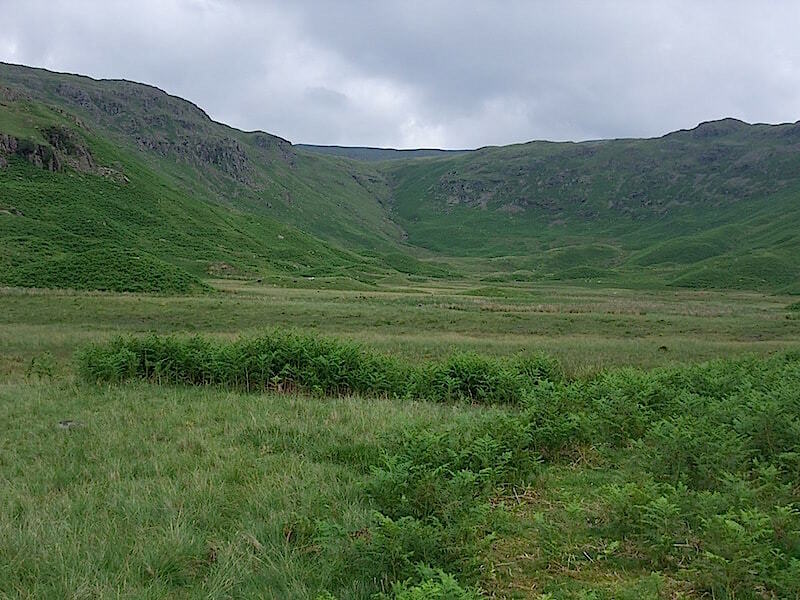 We’ve moved along from Calf Crag and are now making our way over to Steel Fell, passing this un-named tarn along the way. Looking over Greenburn Bottom across towards Gibson Knott from the walk along to Steel Fell. 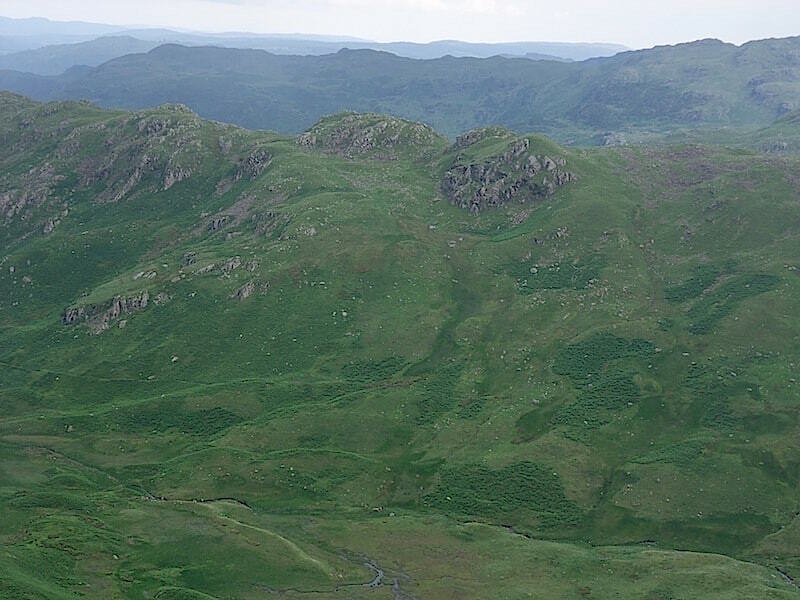 Steel Fell stretching along in front of us and Helm Crag, across Greenburn, over on the right. Steel Fell summit during a ten seconds spell of sunshine. That black cloud soon closed the gap though and we were back in the gloom once more. 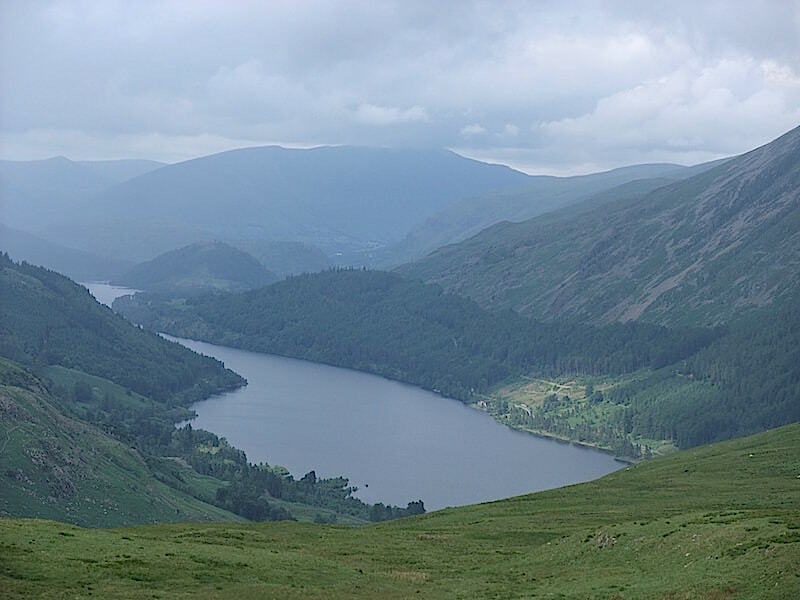 Thirlmere from Steel Fell summit, with the cloud covered mass of Blencathra on the centre skyline. 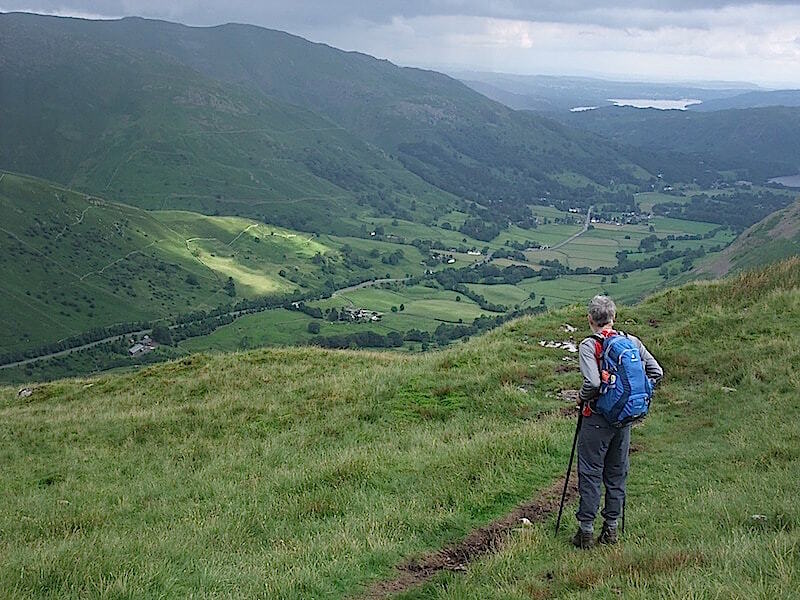 Making our way down Steel Fell and watching that ten seconds worth of sunshine now lighting up the lower slopes of Seat Sandal. A look back up Steel Fell as we reach the bottom of the path. We couldn’t quite work out why but it seemed to take such a long time to get down to here. 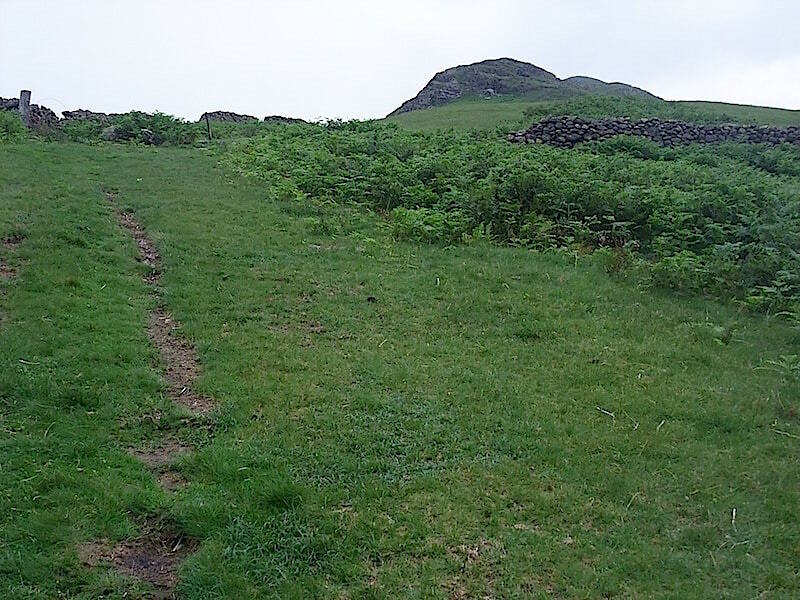 Having given it a bit more thought since it was probably down to the steepness of the slope and the dampness of the grass which was making us extra careful and which would account for any slowing down which occurred. I do wish the weather would buck its ideas up a bit.